Who is the Coleman WeatherMaster 10 for? The Coleman WeatherMaster 10 is perfect if you are an adventurous and really outgoing person who has a passion for camping and outdoor activities this tent is a really great fit for you. It is a 10 person tent that’s so perfect if you have some equally adventurous friends or family they are going to love it themselves. If you are wanting something that is strong and durable and will be a great long-term investment. 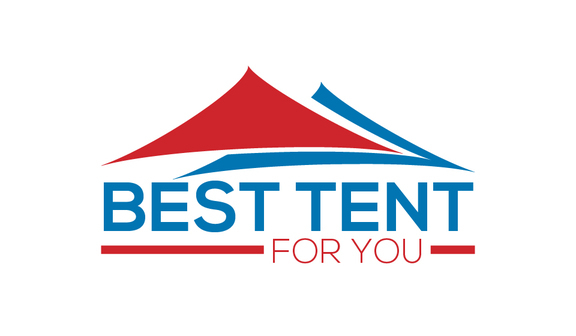 This tent will absolutely stand the test of time and its quality and durability will definitely not disappoint. This Coleman tent is really targeted towards families. Even though the limit of people for this tent is ten I don’t often feel that it was built with that in mind. Even though it is very spacious the size really feels ideal for a family. A family would benefit the most and really enjoy the space and airiness it would provide to them. Someone who is considering a tent like this one I would imagine has one main thought in mind, that’s space. Some who needs or likes a little extra space when they are camping is absolutely going to love this tent. I was able to fit 3, yes 3 regular mattresses in the tent along with the other camping gear and equipment and still nothing was touching the walls. The Coleman WeatherMaster 10 comes with a hinged door. I was a little bit skeptical if this feature was just a marketing ploy by Coleman. I had never personally had a hinged door on a tent before this one. The door is really study and well built. To be frank the door is brilliant for walking in and out even when carrying something heavy and bulky. Even younger children should have no problem getting in and out by themselves with this door. You will love it especially if you are used to some of the lower tier tents somewhat flimsy doors that often get stuck. 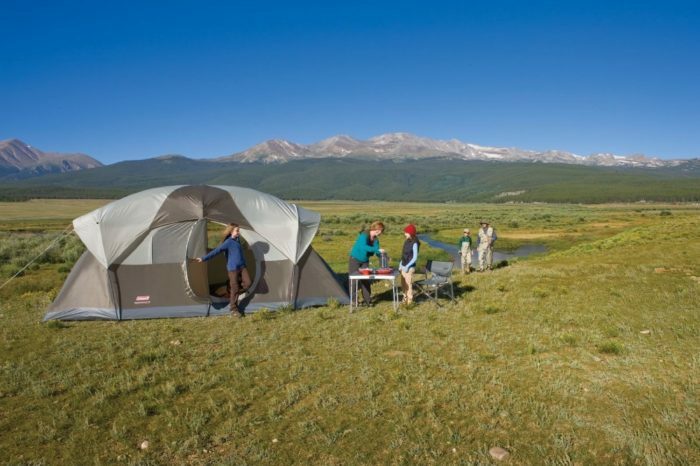 Having this feature will almost certainly improve the longevity of this tent if you are a frequent camper. The set up was super easy. I know some other people have negative thoughts when it comes to setting the tent up alone. While most of the set up can be done solo there a couple of parts where two people are recommended. I was able to set it up alone in about 1 hour but I would be confident with 2 people it would only take approximately 20 minutes for the same job. When you really think about what other 10 man tents can be set up solo, there very few intend. So this really isn’t a major downside, but a downside none the less. Airflow in some tents can be a problem and in hot weather it is especially noticeable. In this tent the airflow is fairly good, the whole roof is screened and the tent also has big windows on each side which greatly help particularly when the rainfly is up. One of the negatives of the Coleman WeatherMaster 10 is that is comes with metal stakes and plastic ones for the rainfly. The quality of the stakes is really sub par. I am sure they could easy bend and break if under any significant pressure just like mine did. 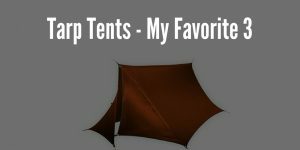 They will suffice if you know the wind and rain isn’t going to be bad on your camping trip. But I would definitely recommend purchasing some sturdier and higher quality stakes. 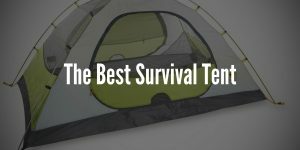 If you are unsure you would even need them I would suggest testing out the ones that are provided when you get the tent. Then you can decide if they are something you think is needed for your trips. Spacious: As I mentioned before the Coleman WeatherMaster 10 is very spacious, it can fit 10 people or 3 queen size airbags, it measures in at 17 x 9 feet, is really is an brilliant size. Even if you are tall you can easily walk around the main room within feeling cramped and having to constantly duck. The center height is 6ft 8in. Waterproof floors: There is absolutely no need for holes on the tents floor. You will no longer experience that super frustrating damp feeling when it’s raining when camping out. Hinged door: as I mentioned before this door is absolutely brilliant and after experiencing it yourself you will not want to ever go back to them more common doors. Coleman has patented this feature for a good reason! Materials: Polyester taffeta 75D 450mm PU coating. Waterproof features: This tent has a lot of waterproofing features. They include: Polyurethane-coated fabric; water repellant thread; inverted leak-free seems and fully tapped rainfly seams. It is not called a WeatherMaster for nothing! Airflow: the screened roof and the windows on all sides really allow the air to flow very well through the tent. Setup: The setup is fairly simple providing you have 2 people to build it. If you have to build it alone like I did it’s going to take you quite a bit longer than with 2 people. I imagine after you have more experience setting it up I am sure you could build it solo within 30 minutes. Warranty: It’s nice to have the warranty because if you do happen to have some issues you are always covered which is a little weight of your shoulders. Poor stakes: The stake quality in my opinion has left much to be desired. They will bend and maybe even break if the weather is windy. So be prepared to have to fork out some more cash if you really want some higher quality stakes. I would personally recommend it. Not fully waterproof: though I have not experienced myself some other users have reported some water getting in under the door rainfly. After I went through and evaluated all user feedback on the Coleman WeatherMaster 10. I can confirm it lives up to the hype and promises that it makes. Even though there are some customers that have issues with the tent and don’t have a good word to say about it. It seems to me that they are few and far between and generally this tent is very highly rated for a reason. Coleman 1st released the Colemean WeatherMaster 10 in 2008 and haven’t altered it since then. That really shows their confidence in the product because they felt they didn’t need to change anything. They are happy with the product as it is. This is a really great indication. 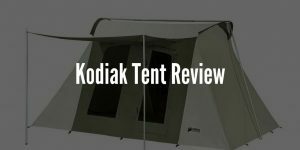 This Coleman Weathermaster 10 is one of the best options available on the market to you and has lots of things to offer that other tents just don’t have.